One of the most positive trends in melt blowing technology is the production of fibrous materials for filtering systems. Filtration is the motion of liquids or gases through a porous medium. Liquid or gaseous media are separated from contaminants during filtration. In the process of filtration suspensions or aerosols are separated by porous screens letting liquid or gas pass but keeping solid particles back. Filtration is performed by filters whose major part is the filtering element (FE), which is a porous screen made of a filtering material (FM). A diversity of filtration conditions exist (various sihes and types of contaminants, volumes of media being filtered and velocity of filtration, degree of cleaning, and so on) which determine the use of a wide range of FM, including paper metal meshes, synthetic and natural fabric and fibers, porous plastics, and powder materials. 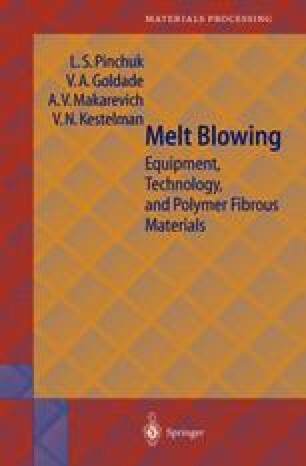 Melt-blown polymer materials occupy their own merited place within the combinations of synthetic FM and are efficiently used in the techniques of purifying technological and working media, as well as industrial wastes.